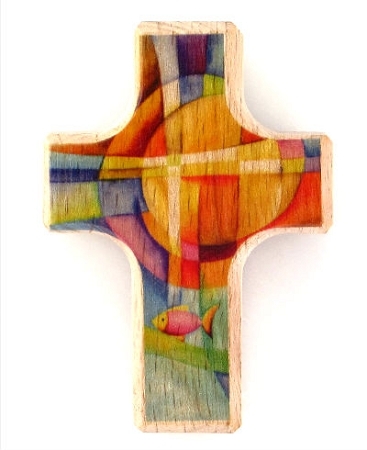 This beautiful wood Cross and with Ichthys design is a little holding cross that makes an ideal gift for just about any occasion. Its colorful and modern design appeals to all ages. Give the pocket prayer cross for a Baptism, Confirmation, as a birthday or get well or thank you gift. The Greek word for fish was used by the early Christians as a shorthand symbol for their faith: “Jesus Christ, Son of God, Savior”. Measures 2 1/2 x 1 1/2", comes in a drawstring gauze bag, perfect for pocket or purse. Copyright Trinity Gift Shop. All Rights Reserved. eCommerce Software by 3dcart.